How many vegetables can I pack into one meal? Challenge. Accepted. Since I can't stop jumping on bandwagons this summer, what's one more? I finally caved and bought a spiralizer. First popsicle molds, and now this. Can't stop. Won't stop. I decided that after making a ton of desserts, snacks, and drinks, I should probably make something sort of healthy...at least as healthy as an alfredo sauce loaded with parmesan cheese can be. But wait! There are sweet potatoes in this sauce. 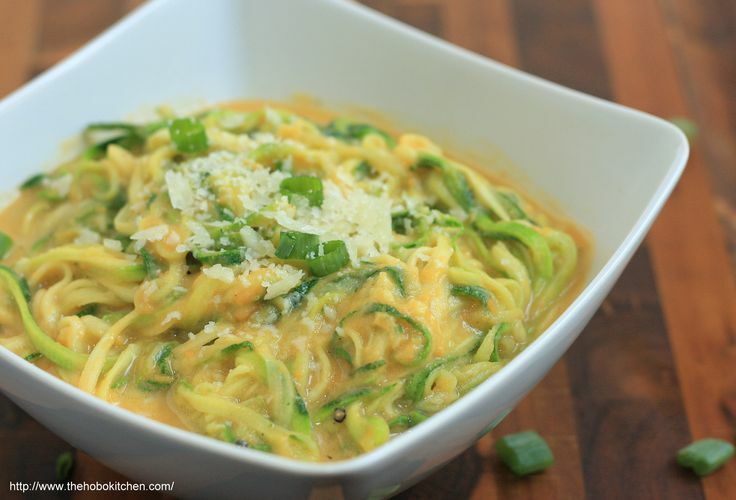 And I'm using spiralized zucchini instead of pasta. I think I just negated those cheese calories. Are you with me? I'm not new to mixing sweet potatoes into a creamy sauce. Waaay back in the day, I made a bangin' sweet potato & crab risotto (Oh, the picture shame! I am seriously going to retake those old photos someday). But I had never made any version of alfredo sauce before. There's no real reason why. I just haven't ever made it. So today is the day we put an end to this blasphemy and just embrace our new friend Alfredo. As I already mentioned, I poured this sauce over zucchini noodles, but you could also use regular old pasta if you wish. The sauce will still be utterly delicious and you will pat yourself on the back for making this. PS - I liked the alfredo sauce so much, I kinda maybe went H.A.M. on it when plating my meal. If you're not a crazy person like myself, you may be able to hold yourself back. Happy New Years everyone! I'm wishing you all the best for 2015! Now on to the food. It's not time for our New Year's resolutions yet, right? This recipe is quite different from those that I usually post. I really try to make as much of my recipes from scratch when possible. I really try to refrain from using processed foods and the like if I can. However! Sometimes exceptions must be made! Let's also be clear that I have nothing against processed food. In fact, I may have visited McDonald's twice in one day this past Sunday. I know, I know! Long story short, I was hungover from attending a Steelers game (AFC North Champions!) and then celebrating until 2am. Who do I think I am cavorting until the wee hours of the morning?!?! Of course, this was followed by an 8am work call the next day...which was followed by a 6 hour drive back to Hoboken. Sooo, in this case, I made a few concessions. Anyhow, I've had a box of macaroni and cheese sitting in my cupboard for a few months. Since I was in my never-ending clean-out-the-pantry mode, I decided I'd better make something with it before it expires. I absolutely hate throwing away food so I knew something needed to be done. 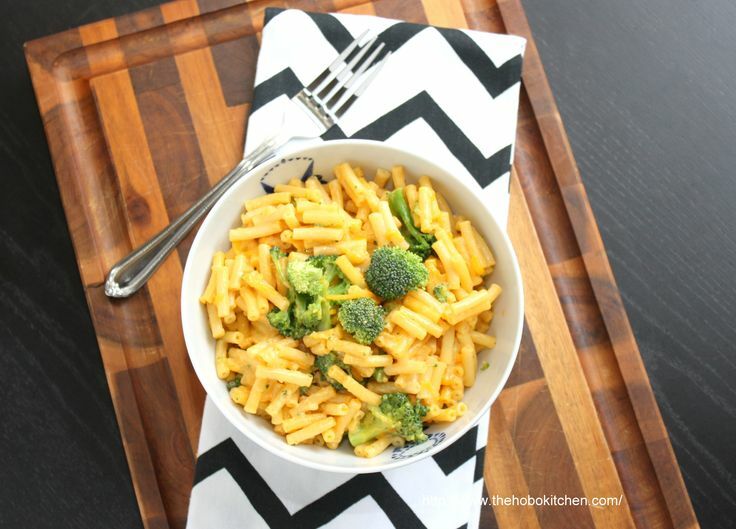 I recalled that Shutterbean had posted a few of her variations on boxed macaroni and cheese a few months ago, so I quickly flipped to that recipe post to check out my options. If I have to use boxed mac and cheese, I may as well do it in style! I'm gonna need a moment of silence to respect this pizza. Ugh. This pizza was that good. I must admit that there were moments in the assembly process when I questioned what I was doing, but I stuck it out and was really pleasantly surprised by the outcome. 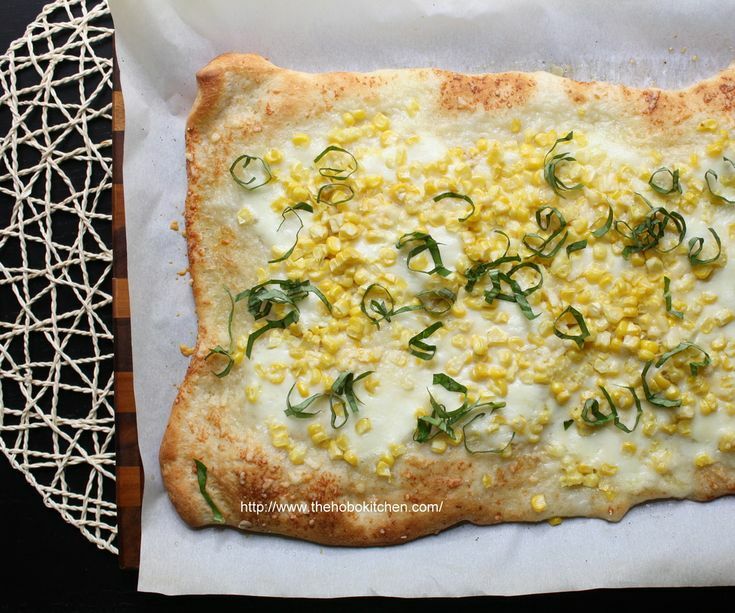 This corn pizza can pretty much conquer summer. In fact, I think it's already dropped the mike and walked away. Boom. I used refrigerated pizza crust dough for this pie. Don't judge. I don't "do" dough. Or I should say that dough and I don't actually get along. Only questionable things can come from my experimentation in that arena. Anyhow, today I am thankful for refrigerated pizza crust. I made sure to sprinkle some extra parmesan cheese on the crust so even if you happen to get more crust than another person (ahem...I will never be able to roll out any sort of dough into a perfectly geometric shape) you're still getting a treat. Go get you some! Side note: I'm heading to my first ever food blog conference tomorrow in NYC!!! Ahhhh!!! What to wear? Is my phone charged? Don't I have a notebook that doesn't have flour all over it somewhere in this apartment? Camera or no camera? I may still be getting it all together, but I'm excited to meet some cool new people and see a few old friends! Sometimes I just get the urge to make and eat a lot of vegetables. I have to say that I'm pretty happy about these urges right about now. Every other day, I seem to find myself eating three- to four-course meals, then inhaling a pile of desserts. Just to make sure they're good, ya know. I'm doing some self-appointed quality control testing. While I love hanging out with the family and trying to figure out how food much I can actually fit into my stomach, it's time to give myself a reality check. Christmas is over and I really need to reign things in. It's probably a wise idea to kickstart this healthy eating with stuffed squash. Only good things can come from roasting acorn squash, and then stuffing it with brown rice, cranberries, and pecans. In all honesty, this is my first time making a dish using acorn squash and I'm pretty proud of how this turned out. The recipe is so easy that it would be quite difficult for me to fail at making this. Since I'm pretty much still nursing a food hangover (4 days later, oof), simplicity is the name of my game. Anyhow, this whole rant is basically to tell you that I haven't given up on fall. Most definitely not! I'm obsessed with it, but even the most obsessive person has to take a breather once in a while. This is my breather. It's an easy chickpea curry that I adapted from Jessica's little (totally not little) blog. I pulled this dish together pretty quickly for lunch and it was seriously so easy. I had the Pandora Marvin Gaye station going in the background. Just so you know, singing off-key at the top of your lungs really makes time fly by. I should be embarrassed by myself. I'm not. Remember when I said I had something "egg-y" for you? Nope. I didn't forget about it. I just wanted to show you a good taco pasta time before cinco de mayo. Cause you never know when taco pasta needs to happen. Most likely it needs to happen sometime around a Mexican-themed holiday which is not really a Mexican holiday. Think about it. So now that I have your attention, let's talk about a breakfast/lunch/dinner sandwich situation that I think you should get into. I'm usually not one to eat many eggs if they're not in a cookie or a cake. I have been known to enjoy an omelet but usually only if someone else makes it for me. If I have to make breakfast, then we're probably looking at a mug of coffee and maybe an avocado toast if I'm feeling fancy. The other day, I figured I'd go out on a limb and try to expand my egg repertoire. You have one of those too, right? An egg repertoire. I mean, who doesn't? Let's expand together. I present to you, an egg salad sandwich. Oh, and make sure to throw some avocado on there for good measure. All the cool kids are doing it nowadays. I may or may not have completely skipped Thanksgiving recipes on this blog. So little time and so many things to do. Sorry friends, but I'm just going to twist things around and say that I was being a rebel. This may also be known as "Oops. I didn't get around to planning that far in advance." Sorry. You know those recipes you really want to make, but you keep putting off for some reason or another? Yeah, I have those. In fact, I have quite a few of them. Most of those recipes involve yeast or phyllo dough. Recently, I saw that one of those recipes that I have a love/hate relationship with, spanikopita, was remade by Beth M of Budget Bytes. Spanikopita is typically the second thing I order when I sit down at a Greek restaurant. (Clearly, I order the saganaki, or flaming cheese first. Seriously. The cheese is set on fire. You have to love it. Hot, flaming cheese. Stop it now.) I've always wanted to replicate the spanikopita I get at restaurants, but each recipe I took a look at required me to work with those dreaded phyllo sheets. Nope. Thanks. Bye. Then Beth turned things around with a single blog post. I was introduced to the beautiful spinach pie. It makes use of a puff pastry sheet, frozen spinach, and lots of cheese. Yeah, let's do it! Sometimes I crave vegetables. I know. That's weird. Sometimes I also crave soy sauce. Am I freaking you out yet? I was trying to figure out how I could satisfy these cravings when I realized I had some wasabi fettuccine in the cupboard just begging to be used. Thus, the seed was planted to create an Asian noodle salad. I've been neglecting sides lately. But sides haven't been getting much love. Enter the Potato-Portobello Gratin. The first gratin I made was a Broccoli Gratin, which was quite tasty. Since then I've been interested in making another gratin, but I never quite got around to it. I stumbled across this quick side dish a while ago so I finally made time to whip it up.